Who Was James E. Walker? 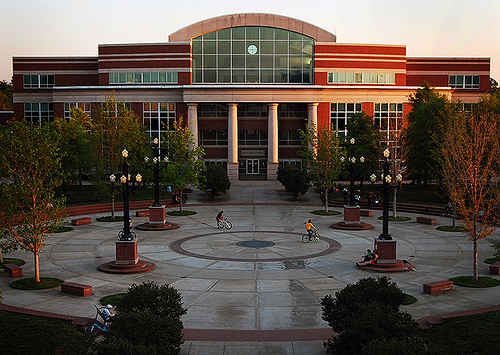 The MTSU Library, an active partner in the scholarly communication process, provides information resources and instructional services to meet the needs of students, faculty, staff and researchers. The library contributes to the university's quest to develop educated men and women through a commitment to strong collection development, innovative, responsive and expert assistance, creative collaboration that expands the availability of resources, careful resource management, and a conducive atmosphere for library service and study. The library, guided by the values of excellence, collaboration, service, and responsibility, is the gathering place for knowledge, wisdom, and the exchange of ideas in an environment of open communication and intellectual freedom. It is a vital partner in the academic mission of the university. A skilled staff, with the support of innovative technology, provides the diverse academic community with information, regardless of location, that is important to the teaching, research, and service missions of the university. The library is the intellectual center of the university. Its strength is a reflection of the university's commitment to education and research. The actions of the library and its staff are guided by enduring principles which influence and govern its decisions. We strive for excellence in our work and encourage participation in planning and improving library programs and services. We promote the sharing of professional expertise with colleagues through service, presentations, and publications. We are committed to enhancing staff expertise by providing opportunities to learn new skills and to keep pace with change. We acknowledge the performance and special contributions of our staff. We are committed to offering responsive and professional service. We actively seek out and respond to the needs of our users. We explore new forms of information and innovative methods of delivery which are cost effective and provide efficient access. We promote centralized open access, maximize information availability, and serve as a gateway to worldwide information, both on campus and at distant sites. We teach our users to become self-sufficient in finding, interpreting, and using information. We are committed to fair, honest, responsive and respectful treatment of our public and each other. We provide broad resources and programs to meet our users' needs. We are committed to responsible management and optimal use of our resources in support of the teaching and research needs of the university community. We strive to offer a positive environment which is safe and conducive to learning. 250,000 gross square feet - 187,500 net square feet. Four floors above ground, fully accessible to all persons with disabilities. Thomas, Miller & Partners & I C Thomasson Associates, Inc. In 1912, the first library at Middle Tennessee State Normal School was established by newly hired librarian Betty Avent Murfree, boasting a collection of 75 donated volumes. It was housed on the third floor of Kirksey Old Main; its collection eventually grew to 2,000 volumes. 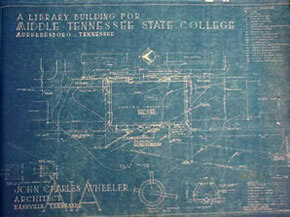 By 1925, a separate library building was needed for the newly named Middle Tennessee State Teachers College. Designed to accommodate 20,000 volumes, the structure was erected across from Old Main on the site where Peck Hall now stands. In 1958, the Andrew L. Todd Library was constructed between the Science Building and Jones Hall to accommodate 150,000 volumes. In 1970, an addition was built in order to meet the needs of a growing university. Eventually the Todd Library, designed to hold 225,000 volumes, held more than 600,000 volumes. Ground was broken for the sorely needed new library on September 11, 1996, the university’s 85th birthday. Named for Dr. James E. Walker, 8th President of Middle Tennessee State University and avid library supporter, the 250,000 square-foot building offers a visible presence for the university’s commitment to student education and faculty research. Combining space and services in an environment that inspires learning and interaction, the new building brings together the intellectual and social aspects of the institution and of the entire community. The library provides access to information worldwide through 350 public computer workstations. The building has a capacity for 800,000 volumes and offers 1,500 general reader seats, 1,000 individual study carrel seats. Facilities for private study are provided through 31 group study rooms and 60 faculty research studies. The library has an active program of instruction, teaching use of databases and other resources through two lab rooms. An expanded history of the library was published in the journal Tennessee Libraries. James Edwin Walker graduated from Alabama State University with a bachelor's degree in biology, earned a master's in special education from Atlanta University, and graduated from Pennsylvania State University's doctoral program in education. He was a post-doctoral fellow at the University of Alabama in Higher Education Administration and was also a graduate of the Harvard University Institute for Educational Management. 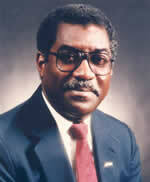 Dr. Walker was provost and vice president for academic affairs at the University of Northern Colorado until he became President of MTSU in 1991. He left MTSU in 2000 to become President of Southern Illinois University, the place his teaching career started decades before. He died at his home on February 6, 2006, after a battle with cancer. Dr. Walker's strong support for the Library is continued today by President McPhee.